There are days when there's just no escaping dull, lifeless hair, no matter how many cautionary steps you take to keep your locks in tip-top shape. The culprit is not always internal—most of the time, dull or tired-looking hair is also caused by hair aggressors like pollution, sweat, and product build-up. If untreated, stress-related hair problems may cause hair to be limp and heavy. And while there are quick fixes, like getting a salon treatment, what really does wonders is sticking to products and a routine that works. Luckily, breathing life back into your tresses doesn't always require you to go outside the comforts of your own home. It's all about taking the time to destress your tresses. One way to do so is to detoxify your hair. This means ridding your hair of impurities with light but thorough cleansing that allows hair to return to its natural health. With products like the new TRESemmé Detox & Nourish range, the job of cleansing and nourishing your hair has never been easier. Packed with ginger and green tea extracts, it deeply cleanses hair from daily impurities and replenishes lost nutrients. After all, having healthy hair is all about giving it the nourishment it needs. While it can be hard to avoid stress, it's such a relief to know that your hair no longer has to suffer from stress thanks to TREsemmé. The TREsemmé Detox & Nourish range's ginger and green tea scent can be therapeutic, too, so it's a definite anti-stress regimen for any busy fashion girl. 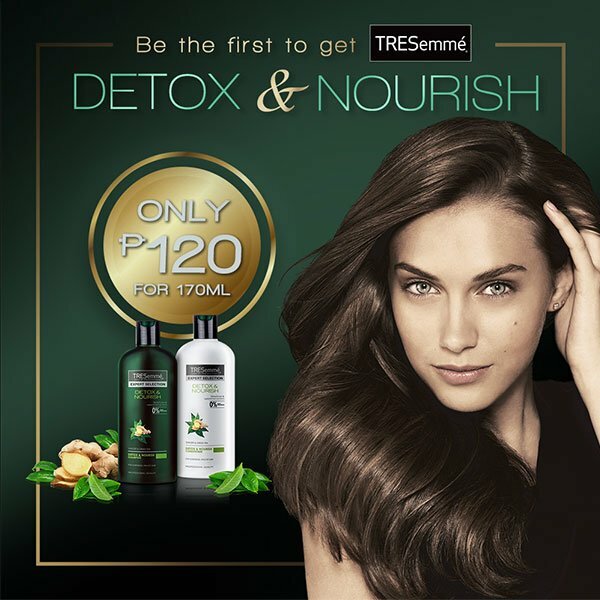 The new TREsemmé Detox & Nourish line is available at all leading supermarkets, personal care stores, drugstores, department stores, and e-comm sites like Lazada. Grab yours now!